I would like to start by introducing myself. I’m the new co-editor in chief, Caroline Ryan. I’m a junior journalism major and I’m very excited to be taking on this role. I think it is important as college students that we have an active voice on campus. After all, we spend most of our time here; why not write about the things on campus that are important to us? My goal is to make the Pioneer more interactive and useful for students. We want the Pioneer to be something every student can relate to. This semester, we are introducing student surveys in our Features section on an array of topics of interest. 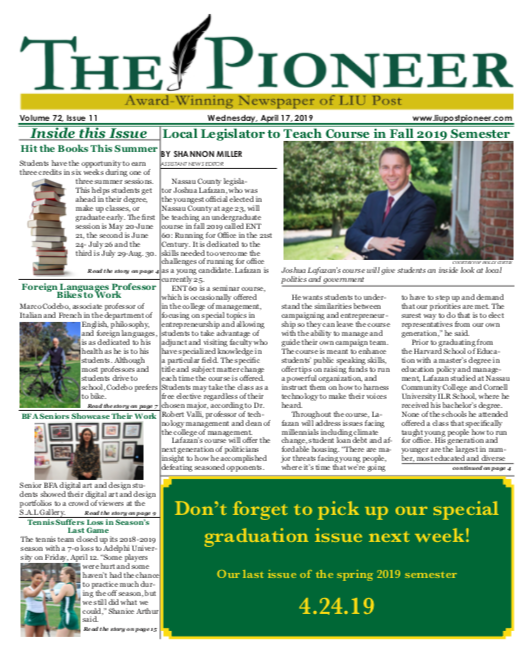 We are hoping that opening up the paper to everyone will broaden the Pioneer’s readership, and make students excited to pick up the Pioneer on campus every Wednesday or read it each week at www.liupostpioneer.com. We welcome all students to contribute to our award winning paper.